So you may be wondering what I've been up to since returning to the UK? 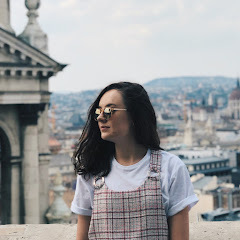 (In case you didn't already know, I spent the last 2 months travelling around Asia - there's a post about it here - and I've only been home a matter of days). Well, I may or may not have spent my first day back at a shopping centre... Do I have a shopping problem? Maybe. Did I need these clothes? Probably not. Nonetheless, my body wasn't quite prepared for the change in temperature between here and Bali, so buying some new jumpers felt the only appropriate thing to do. Ahhh, the Mom Jeans, the item that spurred on the rest of this haul. I already own a pair of light wash mom jeans, but figured a darker pair would look better during autumn and winter. These ones fit really well, and are actually a decent length on me. 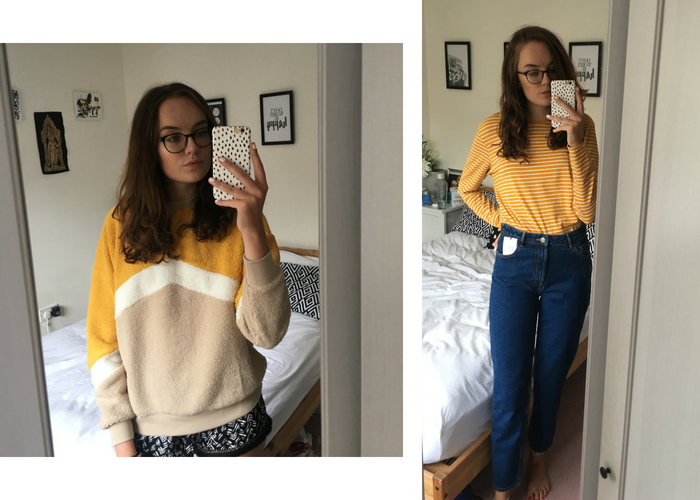 I have really long legs - I normally buy my jeans in Topshop's Tall section, so these came as a really nice surprise, especially as they're half the price of Topshop's offerings. As soon as I saw this jumper I fell in love and knew I had to have it. Look at those colours!! It's a fuzzy, teddy material and I bought mine in a size up so it's slightly slouchier. I posted a photo of it on Instagram and it received a lot of love, so I'm glad it's not just me that's obsessed with it. 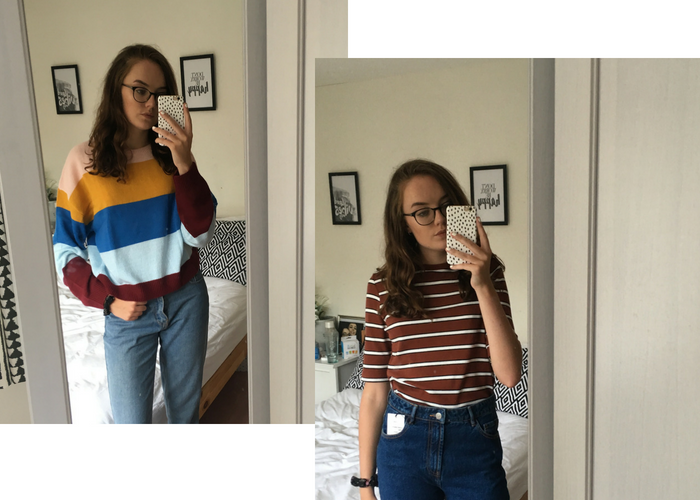 I don't actually own many long sleeve tops, it's mainly just t-shirts or jumpers, so there was more than enough room for this mustard striped one in my wardrobe. I bought this in an XL because this gal cannot stand tight tops, gimme room to breathe. Okay, so I've already called it, I think this jumper is going to be very very popular this season. The colours are gorgeous and it's really soft considering the price, so expect to see it all over Instagram before you know it. I'm not sure I ever imagined I'd buy a brown top, but here we are, it's 2018 and I'm living for it. This brown shade, or 70s brown as I've seen it called, is literally everywhere at the moment and I figured this top was a really good way to try out the trend. It's not tooooo brown, thanks to the stripes, but it's definitely still brown. Corrr, Becca in light coloured trousers? This haul really is full of firsts. 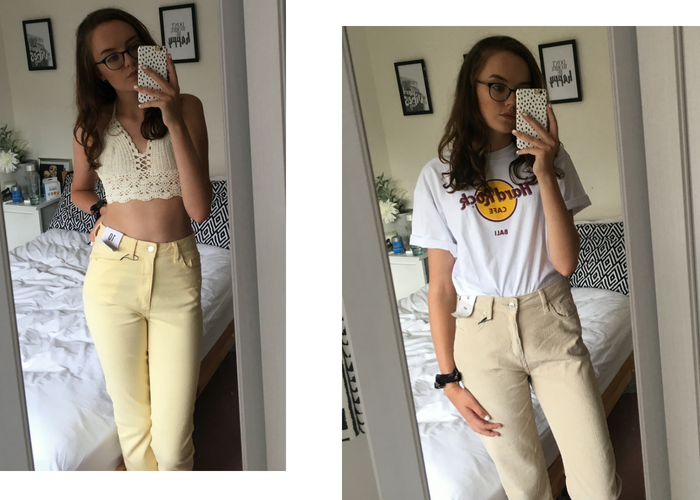 My Mum spotted the yellow jeans in the sale and when I first saw them I wasn't too sure on the colour. But, I tried them on instore and I actually rather like them. Obviously, they're not quite an Autumnal piece, I'm just going to put them away and save them for next summer. I have a feeling the cords are going to be a Marmite piece. When my sister first saw them she asked if I was trying to dress like a Grandma. A little harsh? No? I absolutely love them, the fit is really nice and they're super soft. Although, I'm not entirely sure how I'm going to style them, I'll leave that for future Becca to figure out. I was toying between this shirt and a tshirt in this snakeskin print, and eventually settled on the shirt. Again, I never thought I'd see the day I was wearing snakeskin, but here we are. This shirt is actually from the teen range, I spotted it whilst on my way to the changing rooms and grabbed it in the biggest size I could find. I actually love it, even if it is a bit Pat Butcher. The sweatshirt isn't the most interesting piece of clothing in this haul but it's so so soft and I love the neckline. I got this in an XL to wear slouchy on lazy days, and to early morning lectures after a heavy one the night before. A godsend. 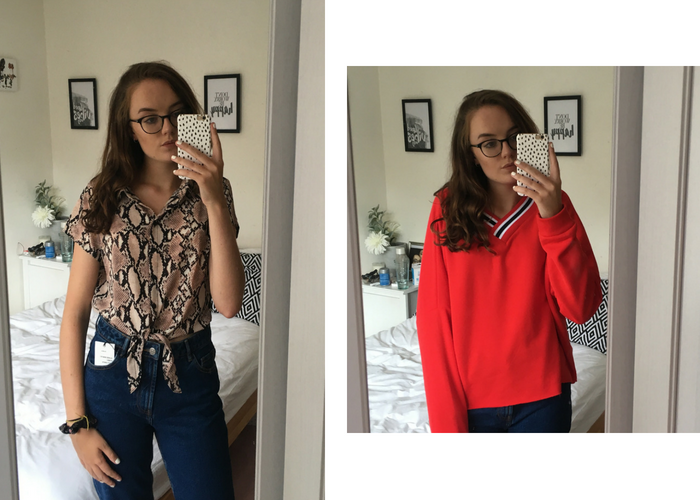 Are there any A/W trends you are loving? 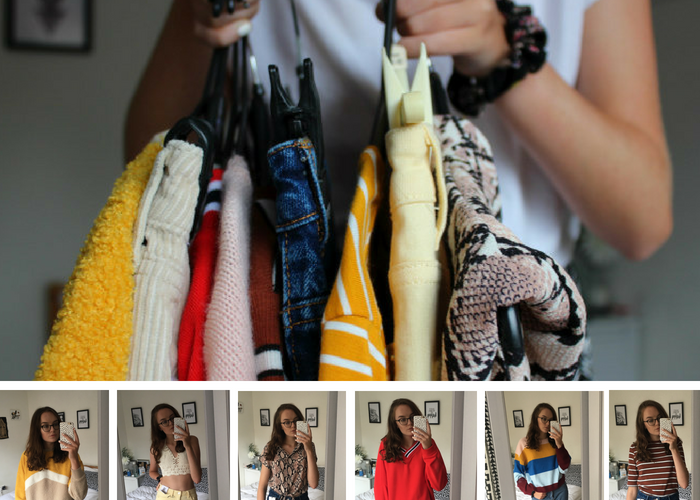 I actually love everything you picked up Becca, especially that first New Look jumper omg! I want everything from this haul! You are ROCKING those yellow jeans, I’ve never thought to buy yellow jeans but I saw Becca wearing yellow jeans so I’m going to buy yellow jeans too!